Have you ever wanted to make money from blogging? Maybe you already do, but you’re not sure how to grow your income. We hope this reference Part will help you build a sustainable blog that will continue to generate returns for a long time. We’ll show you how to pick blog topics that your audience will want to read. How do you know what topics to write about? I began blogging many years ago when I ran a personal finance blog. I launched it with a buddy of mine from college, but we never saw great returns because we didn’t approach it right. We’d be writing for 1-2 hours a day with $100 in revenue per month to show for our efforts. We didn’t have the right target audience and we didn’t know how to generate money from our blog. This lesson taught me that it really does matter what topic you choose to write about on your blog. Throughout this section, I will teach you how to build a blog that will actually get read. First, let’s talk about one of the main decisions you have to make while building a blog. When most people first think about starting a blog, they consider writing about one of their passions. I started writing about personal finance which was a passion of mine. This is great because you will be motivated to write and you can build a real personal connection with your audience. 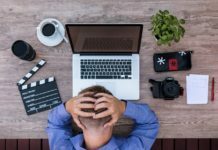 The main downside to starting a blog about your passion is that you have no idea whether it will generate any money and you aren’t thinking about the blog like a revenue-generating business. The other reason people start blogging is simply to make money. Maybe they’ve heard about all the people who are making money online and want to get in on the action. Or maybe they wanted to try the work-at-home lifestyle and thought blogging might work for them. Either way, these bloggers will have a hard time connecting with their audiences if all they post is sponsored content. The challenge is finding a balance between these two mindsets in order to generate money from a blog that you enjoy running. So what should you choose as a topic? Many bloggers believe the old mantra from Field of Dreams “If you build it, they will come.” They think that if they create a blog, an audience will naturally form. That their topic is so unique and their take on it so fresh that people will want to read their blog. They key to making money from blogging is making sure that you are writing a blog about a topic that people care about. The truth is, people only want to read blogs that will either provide them entertainment value or advice. They could care less about what you did last weekend unless you went on an awesome hike and your blog is about hiking. While you can certainly write about your hobbies, you will need to write about them from an angle your audience will enjoy. For example, if you do want to write about hiking, you could write about great hiking trails in a certain region and then weave in your own personal experiences on those trails. The trick of course is finding a topic that you both enjoy and one that will attract readers. So now that you understand how important finding the right blog topic is, it’s time to actually find one that will work for both you and your audience. The tool I primarily use for researching new blog topics and article ideas is KWFinder. It is free for a few searches a day, but you can also use Google AdWords’ Keyword Planner to get similar results (albeit less precision) for free. In the following guide, we’ll cover both KWFinder and Google’s Keyword Planner for finding blog topics. The following approach can be used both to find the topic for you blog as well as topics for articles on your blog. 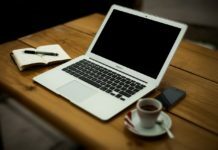 You probably already have ideas for a blog that you want to start or topics that you want to write about on an existing blog. Write those down. These will serve as the basis for your research in the next step. Think of as many ideas as possible as you may have to eliminate quite a few in the next step. My favorite tool for finding topics is KWFinder because it makes understanding related topics very easy and you can clearly see who the competition is for various topics. Now let’s say I wanted to start a blog about “hiking.” As a starting point, I would type “hiking” into the search bar where it says “Enter the keyword” and then press “Find keywords. 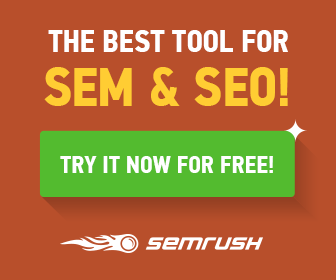 Search: The amount of searches the keyword gets per month. The beauty of this column is that it can be used as a proxy for how popular a topic is. 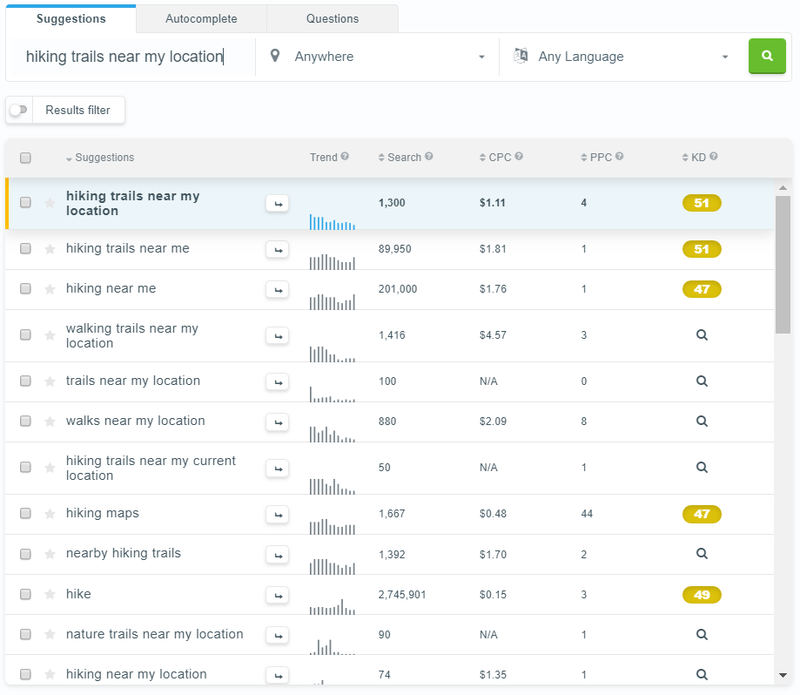 So in simpler terms, the “Suggestions” column shows you the main keyword you searched for as well as related keywords, the “Search” column shows you how frequently a keyword is searched for, and the “KD” column shows you how difficult it will be to rank well for a topic. I primarily use these three columns to evaluate a topic. 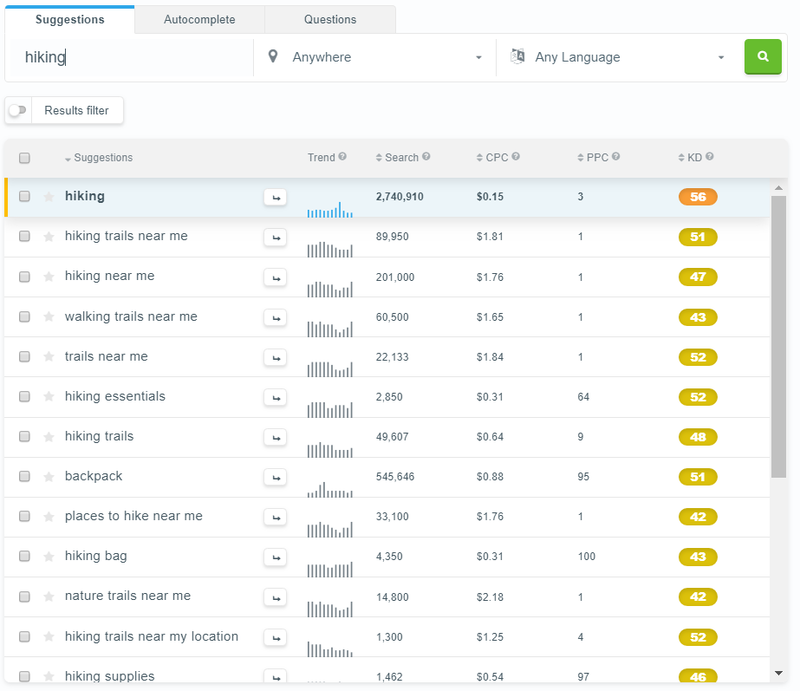 As you can see above, the keyword “hiking” that we searched for is searched 2.7 million times per month and is quite competitive with a KD of 56. Let’s try to find something less competitive. So we searched for “hiking” and realized it is a really competitive and broad topic. How do we find something better to write about? The key is also in KWFinder. When clicked, the little arrow that is to the right of each keyword in the “Suggestions” column will show additional results. So it has fewer searches per month, but also lower competition. It’s still too competitive for me, so let’s back up to the “hiking” search. Ok, so this is better. 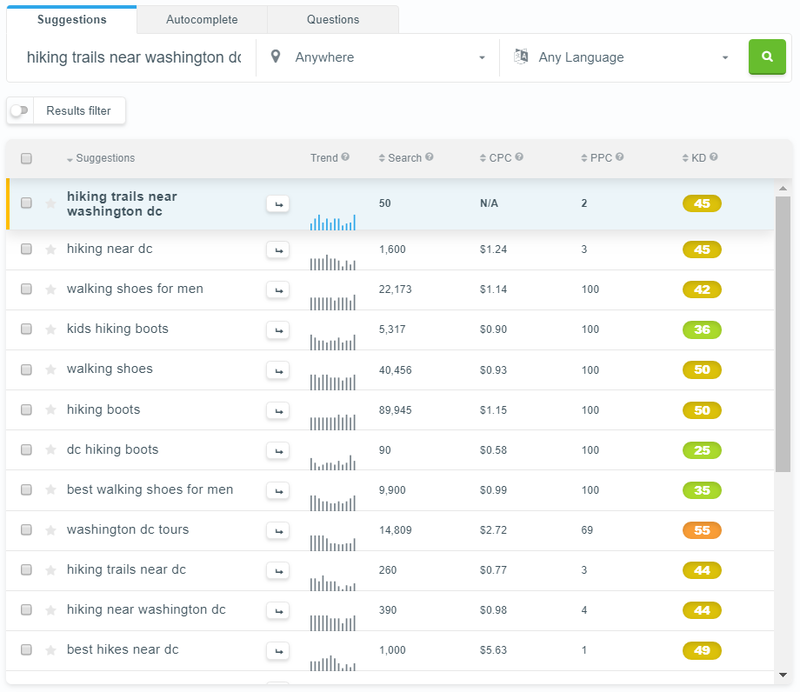 If you wanted to write a blog about hiking, you could start with regional topics such as “hiking near DC” and start building a list of other blog topics in the same way. 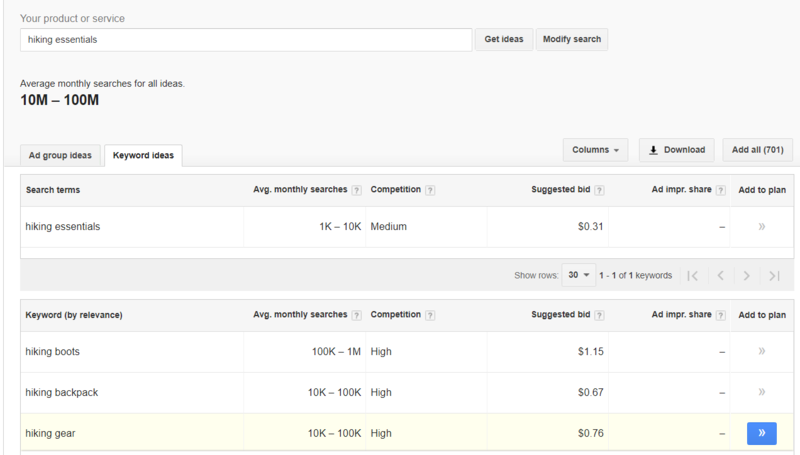 Before I could afford to pay for KWFinder, I used Google’s Keyword Planner tool which comes as part of Google AdWords. It provides only limited data, such as ranges of search volumes, if you’re not running an ad campaign. Find your results on the next page. 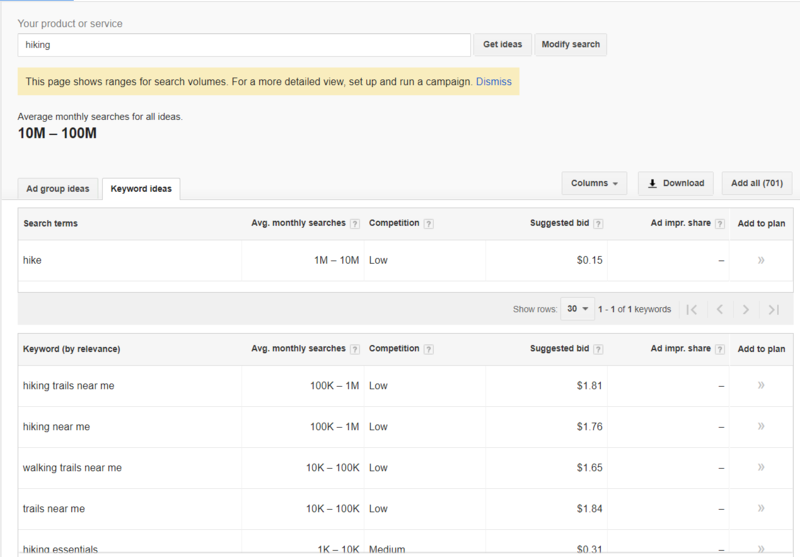 If you aren’t running a Google AdWords campaign, you’ll only be able to see ranges of monthly search volumes, but it can give you a good estimate when you compare different search terms. As with KWFinder, you can use the Keyword Planner to continue searching for related keywords. 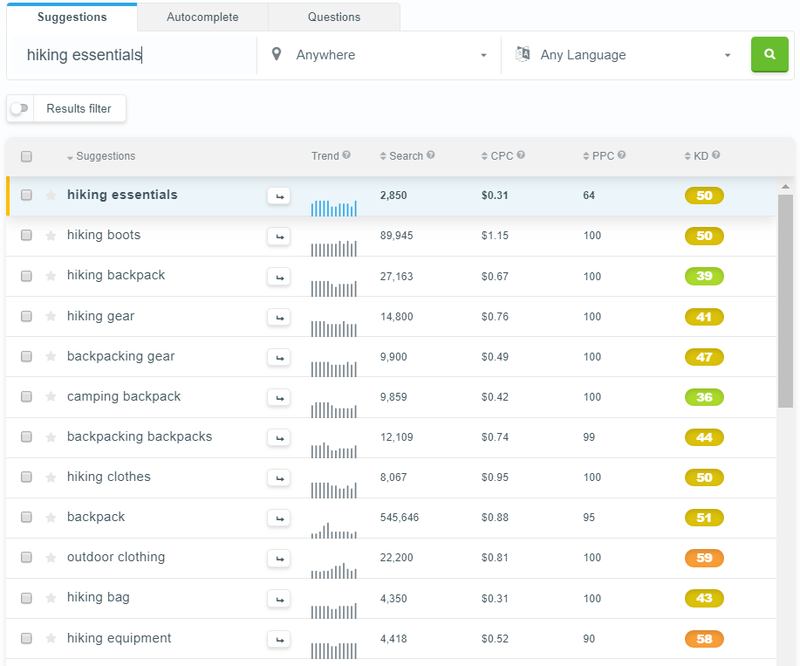 Again using the example of “hiking essentials,” you can find related keywords and search volumes for these other keywords. Generate a list of potential topics. 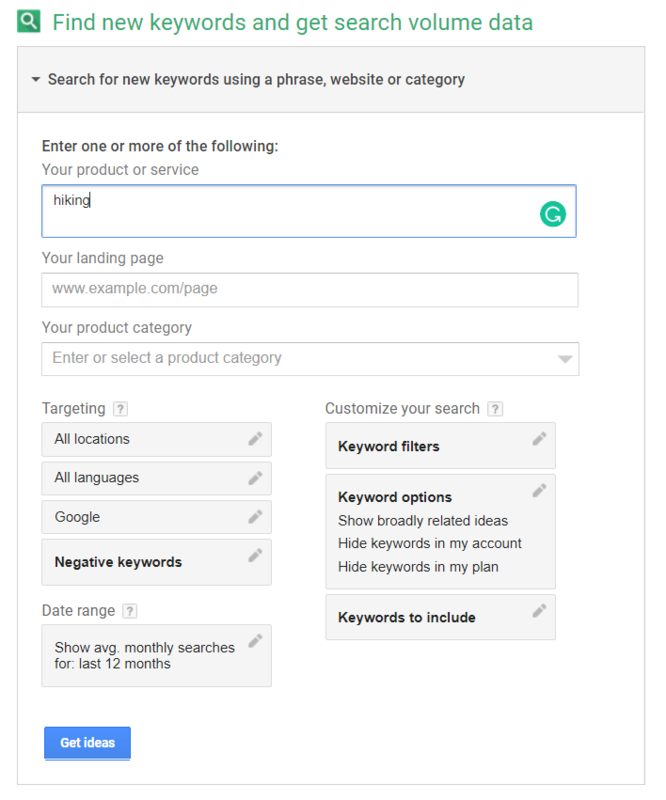 Go to KWFinder or Google AdWords’ Keyword Planner. 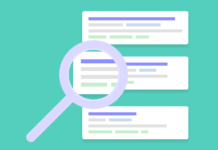 Search for your topics in KWFinder or Keyword Planner and refine your searches until you find topics with low competition, but high search volumes. Keep a list of any topics you think could work. Build your blog and write about these topics (see Chapter 2 & 3 of this guide).